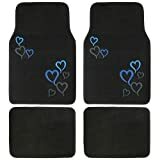 Instantly customize your car, truck, SUV, or van with these High Heels set of floor mats. Universal size fits almost all vehicles. Easy to wash and very durable. Protects your vehicle’s carpet from damage.